The huge task of training the 15 000 selected volunteers for the 2010 World Cup is set to begin in February. As the 'face' of the World Cup, these volunteers will give their time, talents and skills to make the World Cup a success. Volunteers, who work free of charge to make the event a success, are a vital part of any FIFA World Cup. Volunteering is not only a great way of being part of the biggest sporting event in the world; it is also about developing skills and helping to develop a culture of community service in South Africa. overwhelming response from all over the world. A total of 67 999 people from 170 countries applied. During the application period from 20 July 2009 to 31 August 2009, an average of 1 600 applications were received per day. 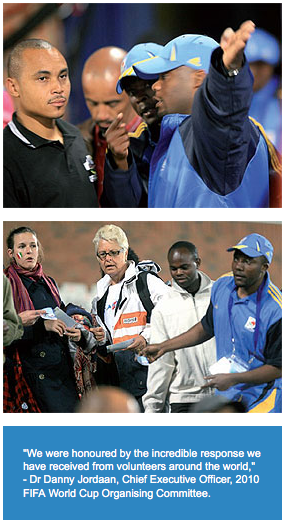 Some of the volunteers have already taken part in volunteer work during the Final Draw for the 2010 FIFA World Cup held in Cape Town in December last year. The applications that were received, were for the Final Draw, as well as for the World Cup and for the Football for Hope Festival in Johannesburg. The festival will run at the same time as the World Cup this year. The highest number of applications outside of the host country was from Nigeria with a total of 750. The United States of America followed with 554 applications and Brazil was close behind with 489. There were 449 applications from Zimbabwe and 414 from Italy. Other African countries that responded were Cameroon with 375, the Democratic Republic of Congo with 109 and Lesotho with 106. Locally, Johannesburg came in with the most applications receiving a total of 16 280 for Soccer City and Ellis Park. Pretoria received 8 496 applications, followed by Nelson Mandela Bay with 7 365. Cape Town received 5 998 applications, with Nelspruit and Rustenburg close behind receiving 5 781 and 5 558 respectively. Durban received 5 148 applications, Polokwane received 5 503 and Bloemfontein received 4 371. To the call for volunteers with sign-language skills, 83 applicants applied to help people who have hearing problems. All the successful applicants will be trained in their respective fields between February and May this year.